03. Fast Money - As in Getting It! 12. Always Remember You Also Face Human Opponents! 14. Understanding the Attack Shield and Using It. Welcome to App Gamer's Unofficial Walkthrough and Strategy Guide for Boom Beach - one of the most popular RTS Freemium Games available for iOS and Android today! Getting the most out of a free-to-play freemium game often means not simply putting in the Time (versus the real-world Money) to gain levels and progress, but means understanding HOW the game works in order to obtain a competitive edge over it. You first introduction to the enemy comes in the form of bragging by Lt. Hammerman of the Blackguard who really does not think much of you as an opponent! 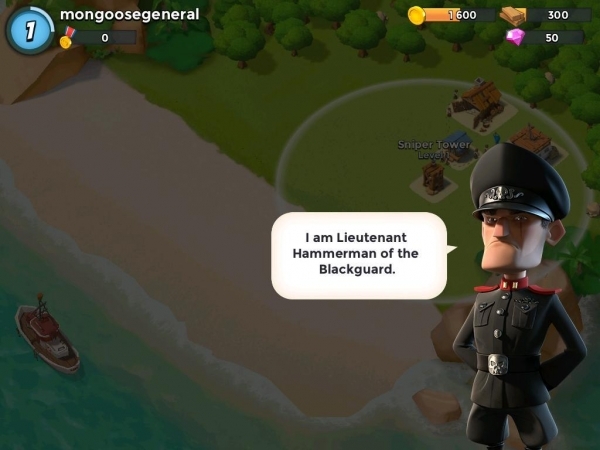 Our Game Guide for Boom Beach addresses the larger issues of making progress without spending Money directly through tricks that you can use against the game itself, as well as some common sense - and not so common sense - activities. To help you develop a winning play style we have split this guide up into two parts - the Walkthrough Guide, and an extensive Hints and Tips Section that will provide you with lots of good and useful information that you can use.